Segrià, a region full of fruit trees and monuments! The presence of a large river in this region determines not only its irrigation crops, with an important network of old ditches and channels (Urgell, Aragon and Catalonia, Pinyana), but also a pioneering hydroelectric industry. The region has been essentially agricultural for centuries, and the orchard, fruit, cereals, fodder and olive tree crops constituted the traditional wealth. In the twentieth century, the industrial sector has been increasing and, nowadays, Lleida focuses its activity between industry and the tertiary sector. 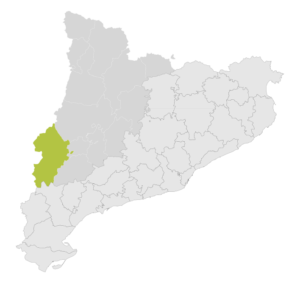 Nevertheless, the rest of the municipalities of the Segrià are essentially agricultural, with a pioneering specialization in the fruit (pear, apple and peach). Regarding the cultural attractions, it is important to underline the existence of a monumental Lleida.